*15% deposit is required in advance to reserve the room, the deposit payment could be payed with all major creditcards using paypal, the balance has to be payed at the hotel at the check in. This fantastic property is Hostal Los Almendros, right infront of Sunzal Pointbreak, ocean view and direct access to the surf a budget accommodation right infront of the amazing pointbreak, the most popular surf spot in El Salvador. 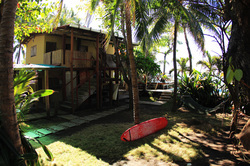 The house is located next to the most important tourism destination Playa El Tunco. The house offer five separated rooms, each room is spacious and fresh, they all include private bathroom and shower. To reduce our biological foot print we provide fans instead of air conditioning. We have a total of eight rooms and each room has a capacity limit of three people per room. Enjoy the beatiful view of the Pacific Ocean from our upstairs terrace. Great place for groups looking for privacy and a kitchen, best deal for the full house for 5 to 12 person max. Contact the hostal and get a quote. About Playa El Tunco and Sunzal. Sunzal and Playa El Tunco is one of the most popular area, located just 30 minutes away from the international airport and just a couple kilometers from Puerto de La Libertad, its location make of this destination one of the most visited touristic destination of the country, visited by locat tourism from the city San Salvador and also for internationtal tourism, its popularity is also because of the amazing surf for all levels, Sunzal pointbreak is one of the most consistence surf spot of the country and is a perfect spot for advance and also for beginners interested to learn and start to enjoy the sport. Other hotel in this location. Tortuga surfcamp is one of the oldest accommodation in Playa El Tunco, this small surfcamp is located right infront of the ocean in the middle of the beach town of El Tunco, the hotel offer six separated rooms with one, two or three beds, all of them with air conditioner, with private bathroom or shared bathrooms, it also offer meals and drink services to their guests, wifi internet, and swimmingpool. More information about El Tunco beach town and the surf with the surf travel online directory website surfestravel.